According to the Union of Lublin in 1569 was created by the joint Polish-Lithuanian state - Rzeczpospolita. In 1572 King Sigismund II Augustus issued a wagon on the establishment of the troops Ukrainian registered Cossacks to guard the south-eastern boundaries of the Dnieper rapids. The Cossacks made a special list - the roster, received from the Polish king salaries and uniforms. They are also exempted from duties, taxes and the nobles of the court, have gained the right to own land, free to engage in trade, hunting and fisheries. In the early 17 th century there were four regiments of register (500 pers. ), In 1638 - 6 regiments (1000 people).. The Cossacks gave the oath of allegiance to the king, and should reflect raids of Crimean Tatars, to participate in the march on Moscow, as well as suppress the speech of Ukrainian peasants and slaves against the gentry. 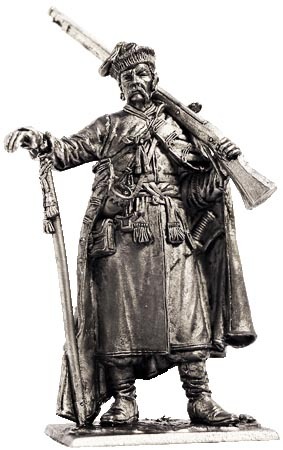 Nevertheless, during the Cossack uprising in Ukraine in 1648, the majority of registered Cossacks sided with Bogdan Khmelnitsky. After a few victories of the Cossacks of the Polish troops in 1649 was awarded Zborowski peace treaty, under which the number of registered Cossacks had risen to 40,000 (16 regiments). In 1651 the Polish army of King John Casimir in the battle of Berestechko defeated Cossack-Tatar army Hetman Khmelnitsky. By Belotserkovsky agreement reduced the number of registered Cossacks to 20 thousand. After the reunification of Ukraine and Russia in 1654 (Pereyaslavskaya Council) Tsar Alexei Mikhailovich formally approved roster of 60 thousand. 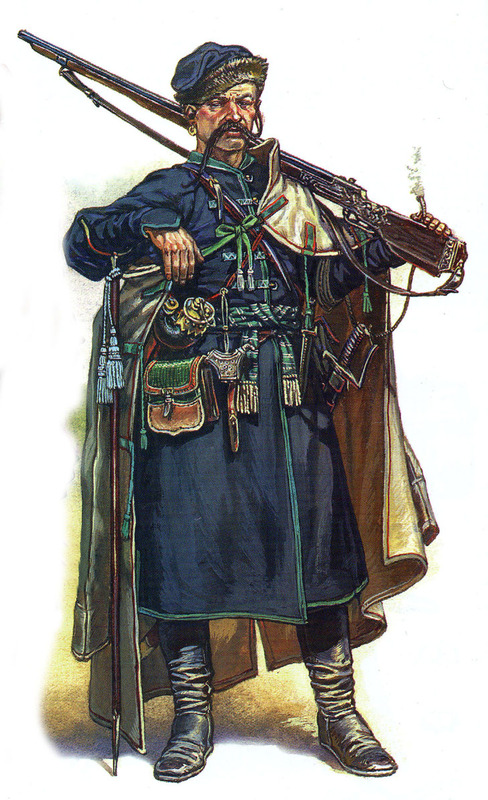 All registered Cossacks were riding horses, but usually fought on foot, firing their muskets or arquebus. Cossack clothing consists of dark blue cloth coat (Captan, Uhocha), trousers and hat with a furry. On the shoulders thrown over the roll of rough unpainted cloth. Of the weapons - wick musket with bipod, a saber, a powder flask and bag of bullets. The Cossacks are usually shaved their heads, leaving a long strand of hair (Chuprina), which lays behind the left ear.